Yesterday (26 February) hundreds of London’s outsourced workers, including cleaners, security and catering staff, walked out in the latest in a series of strikes over pay and conditions. Starting from Senate House, home to the University of London’s administrative offices, members of unions including the Independent Workers Union of Great Britain (IWGB), United Voices of the World (UVW), and PCS, marched through central London. University of London students and the RMT union’s London Regional Council supported them. Each group of workers had their own particular grievances, but what they all had in common was the desire to end the “discrimination between those who count and those who don’t count at all,” as eloquently voiced by IWGB member, Emma Margarita Cunalata. Their employers might have chosen to turn a deaf ear to their pleas to clean up outsourcing, but the UK’s media organisations were listening. More than 15 national and regional publications such as the Financial Times, the Press and Journal, The Times and the iNews, covered the walkout. We are organising two day-long trainings in London for IWGB members and volunteers on 2nd March (40 spaces), and 16th March (20 spaces). RSVP is essential to book you and your reps places, by replying to this email – maxdewhurst@iwgb.co.uk – and to get times and location details etc. Para reservar plazas para ti y tus reps y obtener las horas y detalles de la localización etc. solo necesitáis responder al email (maxdewhurst@iwgb.co.uk ). I am writing you on behalf of the Independent Workers’ Union of Great Britain (IWGB), the union which represents the majority of the University of London’s outsourced workers, to once again offer negotiations as a way out of the current crisis. But first, a little context. In the Spring of 2011, as a University of London postgrad student, I started working with UoL cleaners. At the time they earned just a hare above the minimum wage (then £5.90 per hour), had the statutory minimum of holidays, statutory sick pay, and no company pensions. They were not unionised and the contractor at the time, Balfour Beatty Workplace, had no regard for even the basics of employment law. Cleaners and porters went months without payment of wages sometimes, abuse was rife and maltreatment the norm. These are the effects of outsourcing. In addition to setting up English classes to try and help provide a route out of the dire circumstances of being a University of London cleaner, we also initiated a massive recruitment drive to UNISON and launched a London Living Wage campaign. After a wildcat strike and some protests the UoL agreed to implement the London Living Wage and Balfour Beatty recognised UNISON for the purposes of collective bargaining. It was industrial action and campaigning which achieved these results. In September 2012, still in UNISON, we launched the 3 Cosas Campaign, in order to achieve the same sick pay, holidays, and pensions for outsourced workers as enjoyed by their directly employed colleagues. For while the London Living Wage represented a massive improvement in pay, their terms and conditions still effectively compelled them to work sick or injured, made it difficult for them to visit family in their home countries, and obliged them to retire into poverty. Before launching the 3 Cosas Campaign I wrote to your predecessor offering negotiations, which were rejected. Unfortunately, during the 3 Cosas Campaign it became clear that the UNISON officials in charge of the branch and London Region had no interest in supporting the outsourced workers. We therefore ran a slate of pro-campaign candidates in local branch elections, only to have the elections invalidated on absurd technicalities. To this day the results have not been released. It is for these reasons that we left UNISON en masse and formed the University of London branch of the IWGB. Despite the fact that virtually all of the outsourced workers left UNISON to join the IWGB, it has been the firm policy of both the University of London and its contractors since that time to only negotiate with UNISON. In addition to the fact that negotiating with an entity which has not authority to represent the workers and no say over the campaigns is utterly futile, the UoL’s decision to negotiate with the union the workers have chosen to leave in disgust is deeply offensive to these workers. After over a year of high profile campaigning, involving multiple protests, videos, social media activity, an email writing campaign to your predecessor, and industrial action, at the end of November, 2013 the University and its contractor announced improved sick pay, holidays, and pensions for Balfour Beatty workers. The terms were still not as good as UoL direct employees but were definitely a major improvement on the abysmal conditions prevailing at the time. Once again, this episode demonstrated that it was public pressure and campaigning which led to an improvement in the working lives and dignity of UoL outsourced workers. But the problem has not been solved. The outsourced workers still work under inferior terms as compared to directly employed colleagues, not just in terms of sick pay, holidays, and pensions, but also in terms of maternity pay and more. Importantly, the outsourced workers suffer a far inferior treatment from management compared to direct employees. The administrative incompetence and incapable management of the outsourcing companies causes immense hardship for your outsourced workers. Pay problems, abusive management, unreasonableness, and incompetence are the defining features of outsourcing at UoL, not mere aberrations. There is no justifiable reason why the predominantly low paid and BME outsourced workforce at UoL should be continuously treated worse than, and have inferior terms and conditions compared to, the better paid, predominantly white British direct employees of the University. It is for all of these reasons that we launched the Back in House campaign in September 2017. Throughout the duration of this campaign we have had an outstanding offer of negotiations. Indeed, I personally have written to you on more than one occasion offering to negotiate. It is the University’s refusal to negotiate, and its dogged dedication to only engaging with the recognised unions, which has led us to escalate campaign pressure. And thus we find ourselves in the midst of the Senate House Boycott, supported by hundreds, including a number of MPs and political leaders. The Boycott has led to numerous event cancellations and lost revenue for the University and has caused irreparable reputational damage. Unlike other campaign tactics which can fizzle out without constant injections or resource and energy, the Boycott simply grows with time and becomes self-propelling; the more people cancel events, the more pressure there is for others to do the same. The Boycott is not being waged out of malice or out of desire to harm the UoL; the Boycott is the culmination of eight years of struggle for dignity and decent working conditions on the part of the workers and an obstinate refusal to engage in dialogue on the part of the University. The thing you need to understand is that just as you have a responsibility to safeguard the finances, sound management, and reputation of the University, we have a responsibility to assist our members in achieving respect, dignity, equal treatment, and decent working conditions. In the absence of dialogue and negotiation, campaign tactics are simply the most expeditious method of achieving these results. Having set the context, I therefore reiterate my offer to talk. The University of London is unique in its refusal to negotiate; indeed the IWGB has engaged in dialogue, debate or negotiation with senior Uber executives, Matthew Taylor, directors of courier companies and a range of other employers.Especially when taking into account the IWGB’s unimpugnable claim to be the representative voice of UoL outsourced workers, the UoL’s position is all the more surprising. But it’s not too late to changecourse. If you agree to negotiate we will send a delegation of IWGB officials, comprised of both full time officers and outsourced worker reps, chosen by us, and we will sit down with you in good faith to see if we can find a negotiated way out of the current crisis. It’s that time of year again when employees up and down the country are getting into gear for the office Christmas party. Some people love the opportunity to kick loose, while others view the annual bash as an ordeal to suffer rather than celebrate. For members of the Independent Workers Union of Great Britain (IWGB) the festive ‘works do’ it an eagerly anticipated event – a time to glam up, let your hair down and brush off the stresses of the year at least for a few hours. And, if every picture really does tell a story, that is exactly what happened at this year’s Christmas party. Happy holidays! 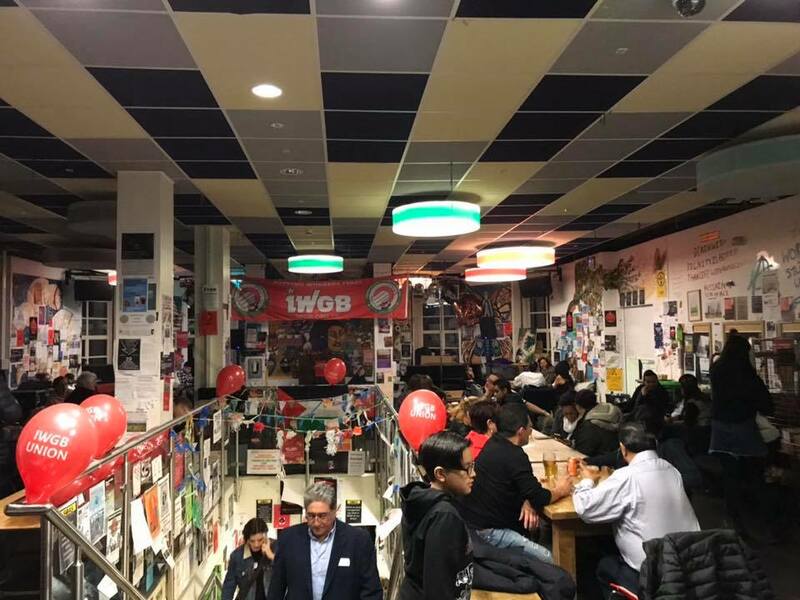 The Independent Workers Union of Great Britain (IWGB) has been busily organising and recruiting cleaners at UCL who are currently undergoing TUPE transfer from their current contractor Tenon FM, to a new company, Sodexo. Although TUPE is designed to protect employees in this situation, history tells us they are right to be concerned. 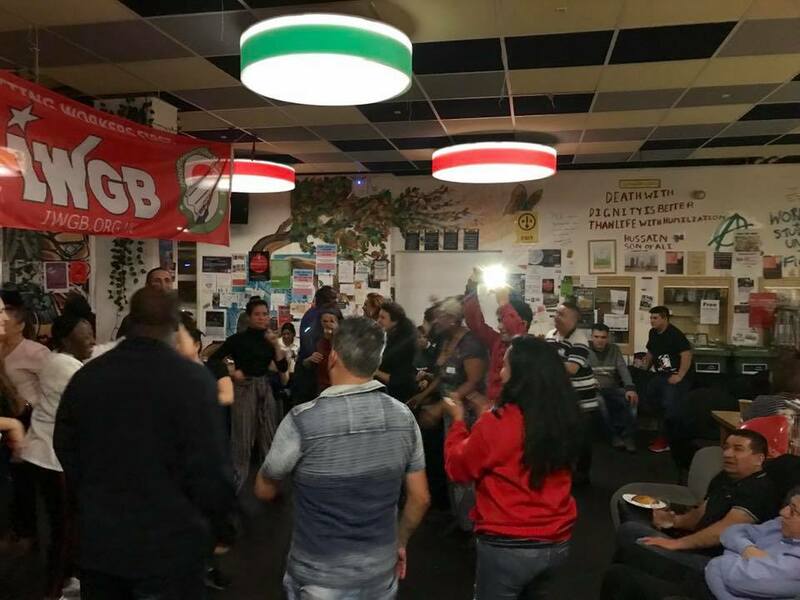 The union recently met with this group of outsourced cleaners and their representatives, who have decided to organise en masse with the IWGB. They are tired of being exploited, badly treated, undermined and forced to work under worse employment conditions than their directly employed colleagues. Sounds familiar? Like other IWGB members, the workers are hungry for justice and workplace equality. They will keep organising and building up towards their big campaign to have workers brought in-house at UCL. Stay tuned for what is coming!! Muy buena reunion con los limpiadores y representantes subcontratados de UCL quienes han decidido organizarse en un gran numero con el sindicato IWGB después de estar cansados de ser explotados, irrespetados y con peores condiciones de empleo que sus colegas quienes trabajan directamente para la Universidad. Ellos estan hambrientos de justicia e igualdad en su lugar de trabajo y seguirán organizandose y trabajando para su gran campaña! ¡Estén atentos para lo que se viene! Despite the wishes of the majority of its staff, the biggest strikes by outsourced workers in higher education history, support from high-profile politicians, and £700,000 wasted on extra security, the University of London (UoL) refuses to commit to ending its discriminatory two-tier workforce. Not even the acres of negative press nor the heartfelt pleas from outsourced staff, the majority of who are from BME backgrounds, have managed to make a chink in the armour of the university’s senior management team. Incidentally, 80 per cent of the institution’s directly employed staff are white. And guess what? Unlike their outsourced BME colleagues, they have enviable pension arrangements and holiday entitlements, are entitled to sick pay and good maternity and paternity pay. Moreover, the university’s ‘dignity at work’ policy ensures they are treated with respect. All of this point to institutionalised discrimination, and it is a disgrace. 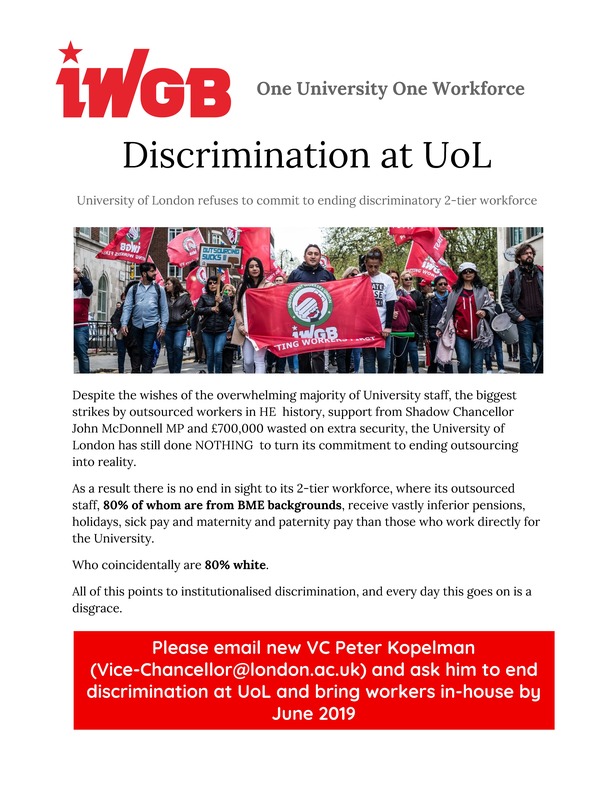 Please email the university’s new vice-chancellor, Peter Kopelman (vice-chancellor@london.ac.uk) and ask him to end discrimination at UoL and bring workers in-house by June 2019. At next week’s branch meeting we’ll be voting on an exciting proposal – to create a new post of ‘women’s officer’ for our local branch. As well as anything else you want to bring to the role! Contact Catherine Morrissey (catherinemorrissey@iwgb.co.uk) for details. 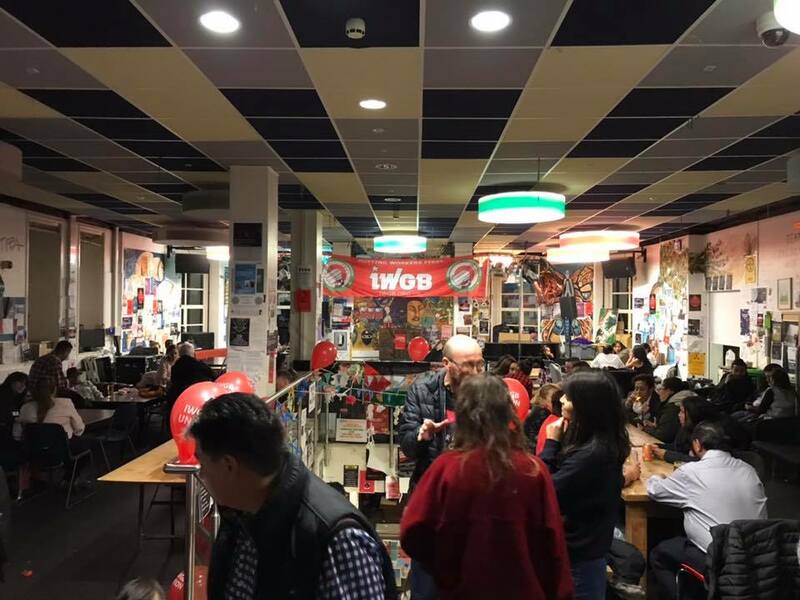 A strike and subsequent demonstration from the IWGB on Wednesday 6 June has pushed the University of London to release a statement regarding the future of outsourced contracts at the university’s central properties.